Description WUXAL Boron is a special boron based suspension for foliar fertilization which guarantees an extremely efficient uptake of boron into the leaf and blossom tissue. WUXAL Boron is more than just a boron-fertilizer: it has a stimulating effect upon plants under physiological stress in their early growth and is well compatible with many pesticides. Result: More yield, more quality. WUXAL Boron buffers the pH-value of the spray solution down to a level which is physiologically well acceptable to plants. 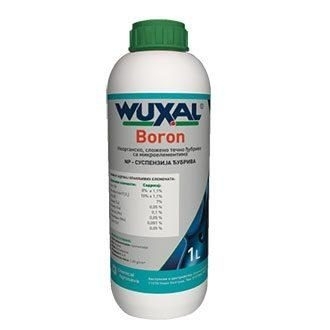 WUXAL Boron is especially recommended for fruit crops, viticulture, vegetables and arable crops in which a deficiency of boron very often occurs together with “hidden” deficiencies of further micronutrients. WUXAL Boron reduces russeting in sensitive varieties of pome fruit and at the same time supports the cell division rate by its high P- and N- content. Result: optimum fruit growth. WUXAL Boron includes special additives that guarantee good rainfastness and excellent adhesiveness even under contrary climatic conditions. Application In order to achieve an improvement of the foliar fertilization effect, applications should be effected in the early morning, early evening or during cloudy weather.